If you are one of those people who invests in mutual funds, you will be familiar with SIPs (Systematic Investment Plans) and how they work. While SIPs enable long-term wealth creation, Systematic Withdrawal Plans or SWPs, as they are also known, are just the opposite. These plans work on the premise that wealth has already been created. Under the SWP, an investor tells the AMC (Asset Management Company) to redeem a certain amount at a fixed date, and credit a fixed sum into his or her bank account at predetermined intervals, for instance, say every month. As such, it is ideal for retired people to meet living requirements, as per their lifestyles. The above is made possible, as basically, an SWP is a service offered by a mutual fund, whereby a specific pay-out is made to an investor (shareholder) at fixed intervals. The preferred interval could be annually, half-yearly, quarterly or monthly. How the SWP scheme works: Each month, units worth Rs 10,000 will be redeemed from the total number of units you hold (with the Rs. 5 lakhs invested), and Rs. 10,000 will be transferred to you. Remember, the number of units you hold in the beginning is calculated by dividing the total money in your SWP by the Net Asset Value (NAV) of the fund. This process continues for as long as the SWP runs or till your holdings are redeemed entirely. If your expected annual rate of return is higher than your annual withdrawal (say 9% returns and 7% withdrawals), then the SWP can run permanently. Note: This example is merely to illustrate the principle of SWP, and it assumes the market is on an upward swing. This may not be the case in the real world. In a rocky market, an SWP can eat into the principal, which is why financial planners usually recommend SWP in balanced funds as these are less volatile than pure equity funds. In other words, if a retired person starts an SWP at 60, his or her monthly expenses could be taken care of till the person is 70-71. Dabbling in the capital markets often involves exposing your hard-earned money to market volatility. The idea behind an SIP or SWP is that you, as an investor, are shielded from this volatility. What SWPs ensure is that investments and withdrawals are both made in a controlled manner rather than investing a lump sum amount, which could be risky. For example, if you make an investment of Rs. 10 lakhs in a mutual fund, but a market crash brings down the fund’s NAV by 30%, it would result in a substantial loss; you would have to wait for recovery before making redemptions. Similarly, in case of redemption, if you redeem all the money at once, there is a great risk of losing further appreciations. As stated earlier, the SWP goes a long way – though not entirely – in cushioning you via controlled withdrawals, which come in two forms – the Fixed Withdrawal and the Appreciation Withdrawal. In the case of Fixed Withdrawals, mutual fund units of a fixed value are sold at predetermined intervals, say every month, and the amount is credited to your bank account. In case of Appreciation Withdrawal, what is redeemed is any gain you make from the time of investment. The tax implications of an SWP are similar to the usual redemption of units of a mutual fund, which are redeemed on a first in, first out (FIFO) basis. This means the units purchased first are redeemed first. This is a tax-efficient way to enjoy an investment, though the actual taxes to be paid will depend on the tenure and nature of the fund. 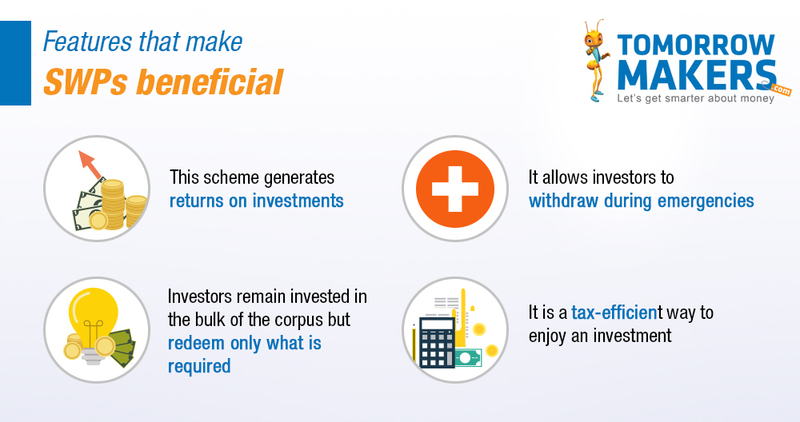 For debt funds, the short-term capital gains tax tenure is three years, and the tax is as per the investor’s slab. Debt mutual funds qualify for long-term capital gains tax if held for three years at 20% with the inflation indexation benefit on the original investments. It is possible to withdraw from an SWP before a year has passed. However, you may have to pay exit loads*. While some mutual funds have removed the exit load on withdrawals up to 15-20% in the first year, liquid funds (debt mutual funds that invest in short-term, minimum-risk market instruments such as treasury bills, government securities etc) do not have exit loads. Apart from capital gains, this is another fee you must watch out for. SWPs are considered an ideal avenue for steady post-retirement income. It is useful when there is no regular income and the retired person is wholly reliant on investments. Additionally, an SWP amount can be increased if you get a good appreciation over and above the SWPs, after about two-three years. An SWP can also help if you require liquidity, as it permits you to access your money precisely when they need. Although it ensures a regular income and saves on taxes in the long term, you cannot open an SWP on a scheme where there is an ongoing SIP. If the market goes into a tailspin, NAVs of mutual funds also fall. Investing through the SIP/SWP route implies choosing an option irrespective of market conditions. This basically means that there is little to worry about if the NAV slides; over the long-term, the volatility usually averages out. It is often recommended that SWPs be made in balanced funds as usually, these are less volatile than pure equity funds. Potential investors in SWPs also need to be mindful of the fact that a fund’s exit load may also apply to the SWP. It can be in the range of 0.25-2%, if applicable and depending upon holding period. However, some funds have removed the exit load on SWPs if investors withdraw up to 15-20% in the first year; this has been done to encourage people to start investing in this instrument.